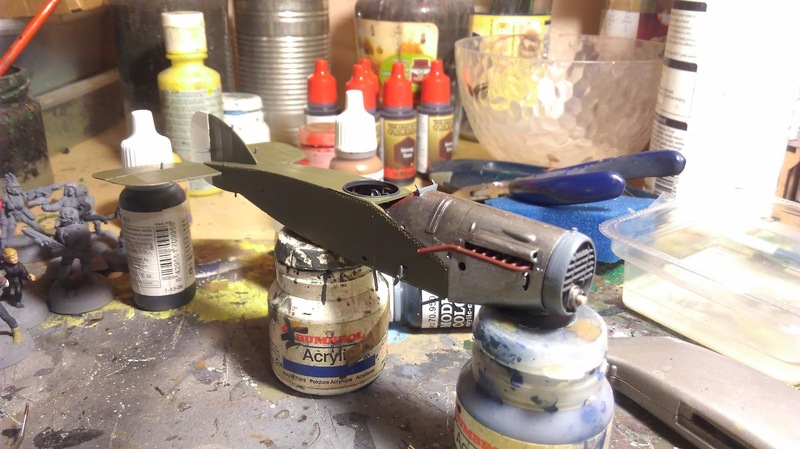 The Brisfit build is chugging along nicely and even though I work away, I am able to do some bits and pieces when I get home. 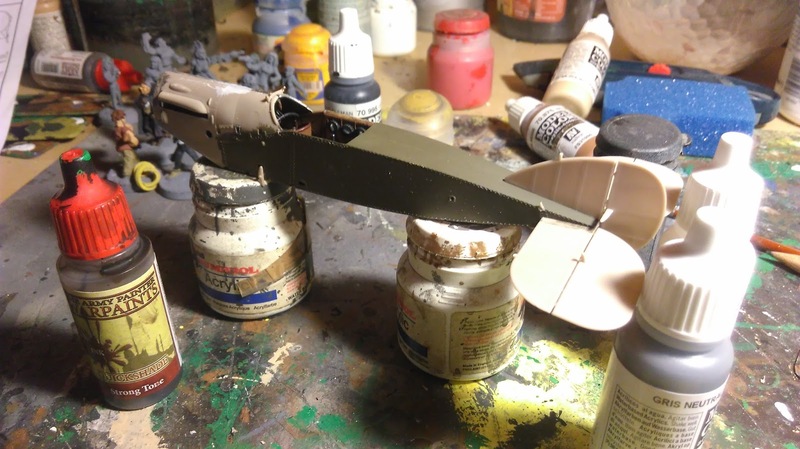 So continuing from Part One, where I had the body glued together, I was able to get the tail assembly on, as the flaps and rudder had to be glued on I had to leave this to dry for a while again. Then it was flipped over and some smaller bits were put in place. You can also see that I have block painted some of the areas, I don't mind if these parts get scratched as they will all be repainted at some point anyway, this is acting as a base coat at the moment. The exhausts were also glued in place at this point. 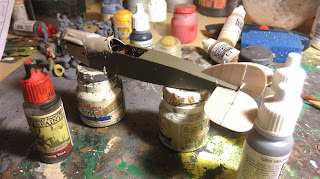 I glued the observer's position cover in place as well, finally sealing up the interior. 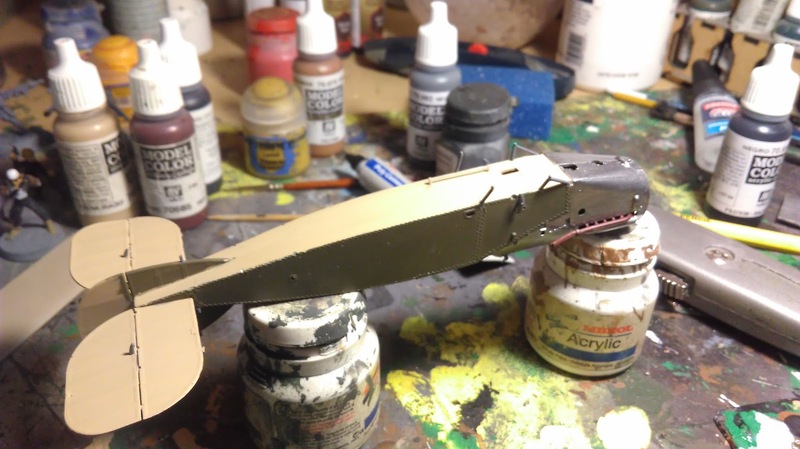 I have also been thinking about weathering on this plane for the future. As you can see in this photo I had a quick go at it as I waited for other bits and pieces to dry. Here I used a blob of white paint thinned down and smeared around with a brush to give the fabric a worn and old feeling. I was quite pleased with the result and will revisit this later. 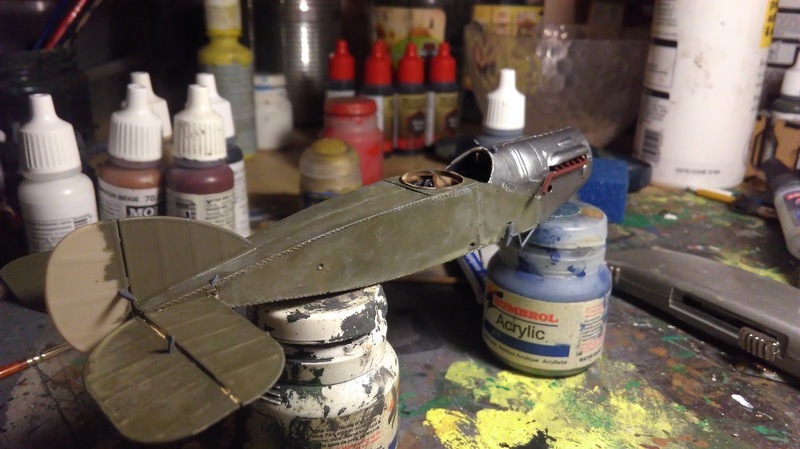 However, for now, I repainted the plane ready for its decals later. The nose was a nice little mini-build and went in place perfectly, I left the radiator flaps up (this is probably not strictly accurate as the plane will be on the ground) as I wanted to see the brass of the radiator below. The next job was the clean up the paint job, gloss varnish the plane and start putting decals on. 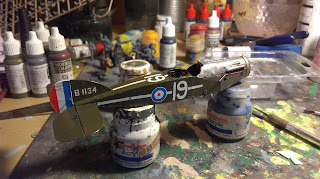 I chose a scheme of aircraft number 19 from 35 Squadron, based in France in February 1918 (partly because I screwed up the decals of the original scheme I wanted to use...). As with the rest of the kit the decals are great; there is very little extra decal paper around the designs, so it doesn't stand out to much and there isn't much to trim off. Then the plane (and decals) was sealed again with gloss varnish and when that had dried, matt varnish. And that is about as far as I had got so this WIP will continue in the next exciting episode! Stay tuned and hang on to your seats!